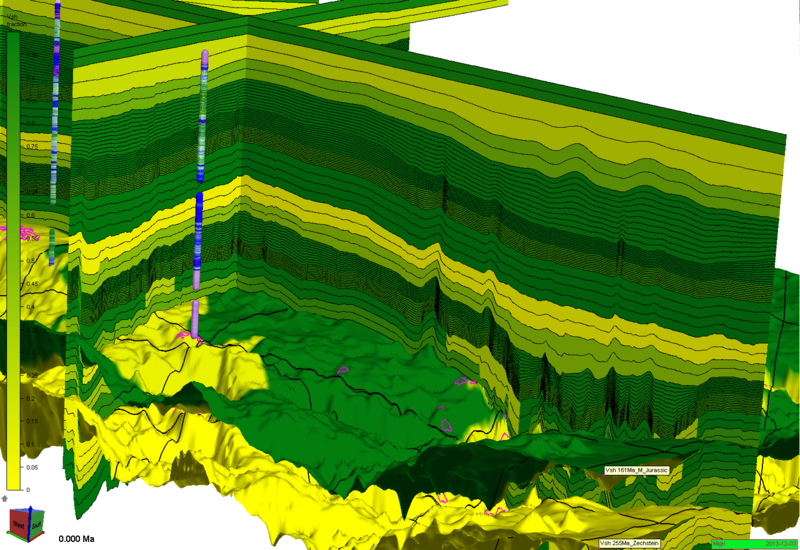 Migri simulates, animates and visualizes the migration of hydrocarbons through 3D models. 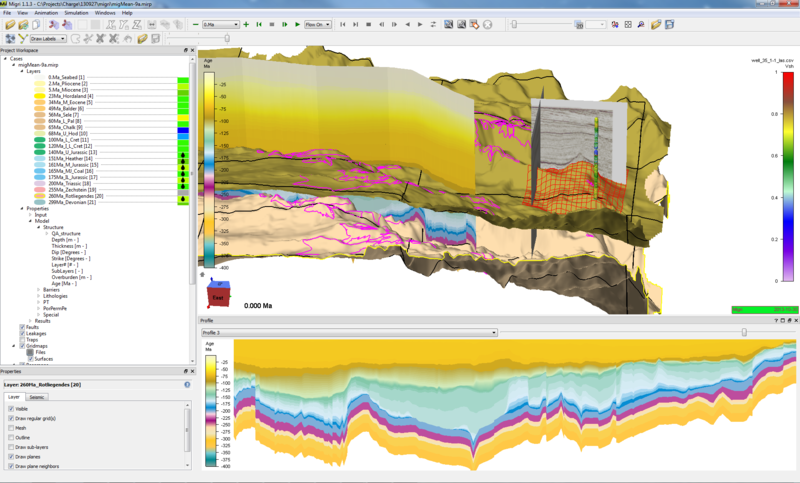 The basin modelling software combines probabilistic Monte Carlo techniques with innovative migration modelling process description to reduce geological uncertainties and assess the petrolem systems and charge risks. The aim is to perform simulations at seismic resolution with complex geometries while retaining interactivity to allow for high turn-around of analysis results. The visualization solution is tightly coupled with the simulator in an interactive system. This enables exploration geologists to run many alternative scenarios in hours rather than days. The main purpose of using Migri is to study and describe uncertainties of the petroleum system of a field, trap or prospect. 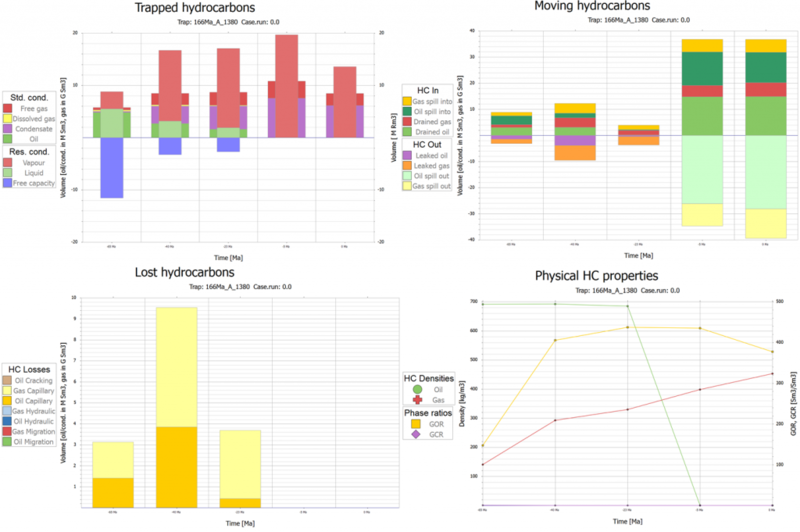 Migri therefore takes a probabilistic approach to the simulation of hydrocarbon migration. The probabilistic results are obtained by running many deterministic simulation runs with input for each run taken from a probabilistic description of the input variables. Input variables are supplied as e.g. 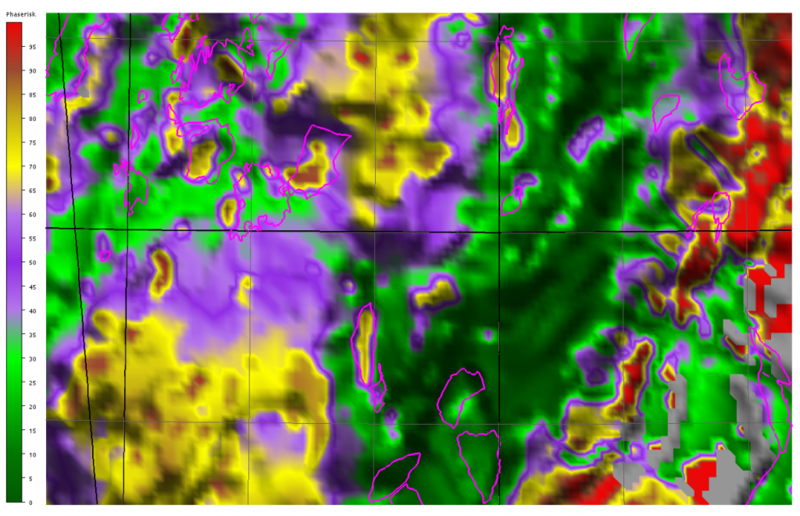 normal distribution maps for each layer. A deterministic Migri simulation run is therefore just a simulation with the mean of all parameters used as input. Migri simulates the hydrocarbon generation and migration history of the basin as a series of time-steps and will visualize results interactively after each time step using a simultaneous simulation and visualization technique. For each time-step the geometry is reconstructed, the geological and flow properties are calculated, the thermal field and generation from source rocks is determined and migration is simulated for the expelled hydrocarbons. 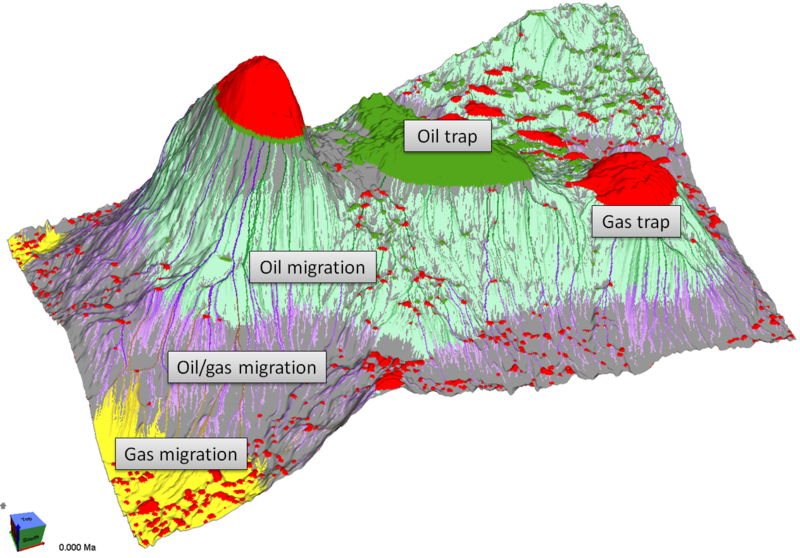 Migri uses a dynamic flowpath technique to transport hydrocarbons from their generation location, via primary migration, secondary migration and into structural and/or stratigraphic traps. The processes of tertiary leakage and spill are also simulated through time. Migration is modeled to occur in regular and/or irregular mesh elements and may be influenced by sealing faults in a model typically close to the seismic scales in resolution. Hydrocarbon saturations within the computing nodes are considered to be non-constant and hysteresis leakage effects are considered. 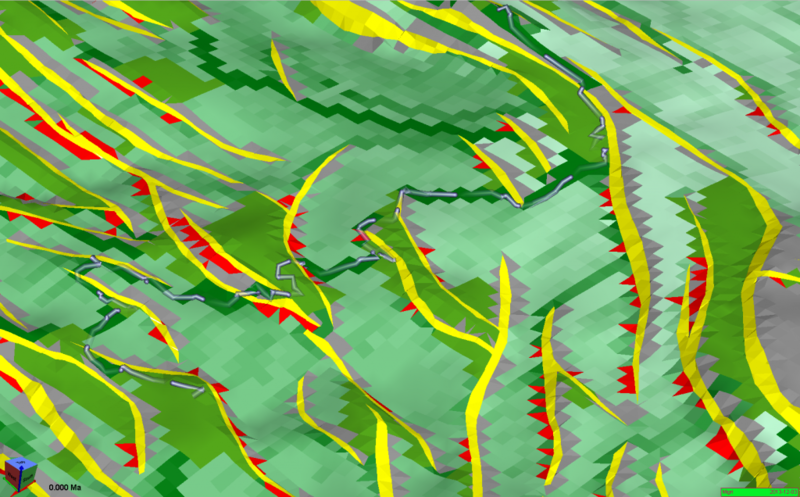 Migri will load horizons from regular depth grids and combine these with fault traces for each layer. The resulting geometrical model contains non-vertical fault planes built by combining the grids with the traces and producing a combination of regular elements away from the faults and non-regular elements around the fault traces. Migri considers the 3D volume to be split into a series of layers and sub-layers. Within each layer there can be a number of sub-layers. Users specify the properties of each layer, while Migri will use algorithms o distribute these properties from the average values of the layers into the values of the sub-layers. In a typical Migri project, the number of layers may be between 10 and 20, each of which may contain 10-50 sublayers. Thus, while the geometry model may contain e.g. 2 million structural elements, the model may easily contain 20 million elements in total. A stratigraphic log is used as input to Migri in order to subdivide the stratigraphy of the layers. The stratigraphic log, which Migri can create using the raw well logs as input, consists of fractions of shale, carbonate and sand sampled versus geological age. Lateral facies variations can be defined by importing facies maps or polygons or by importing and mapping 3d seismic data onto the model layers. 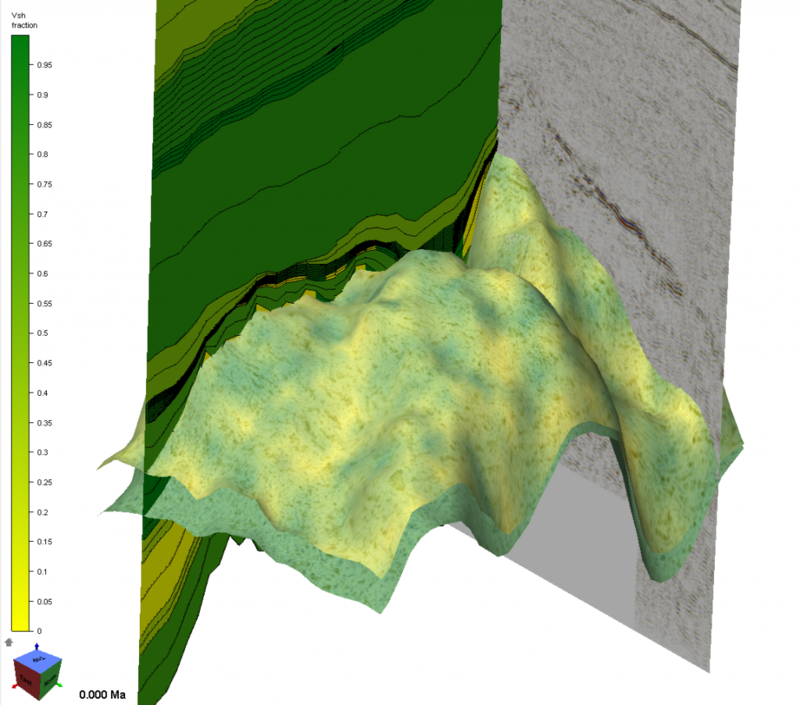 Migri uses as one of the preferred input sources results from existing 3D basin simulations. Geometries, burial, overpressure, temperature, porosity and permeability histories can all be loaded from existing 3D basin models together with oil and gas expulsion histories. E.g. PetroMod 3D projects can easily be converted into Migri models. 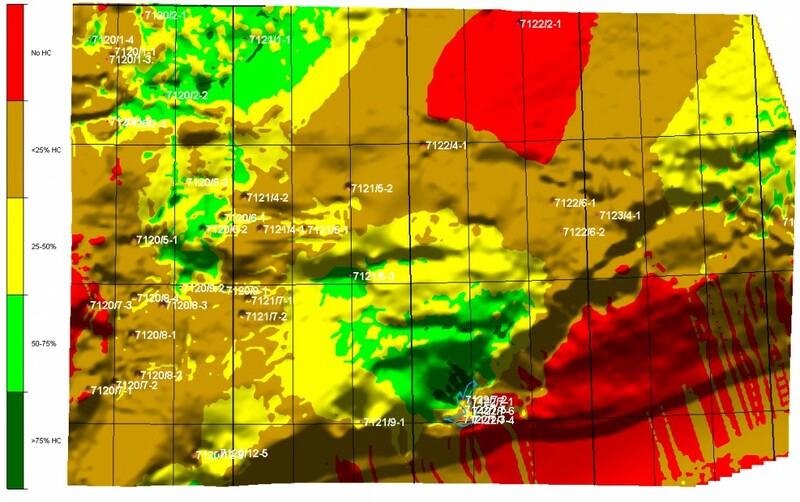 Seabed and erosion maps can also be provided as inputs for each modelled timestep. Migri takes a probabilistic approach to migration modelling. All input parameters and histories are described as distributions with a mean value and standard deviation. The simulation are typically run as Monte Carlo series, where each simulation runs is weighted against misfit to observation data (e.g. column heights or fluid properties). The typical output from the probabilistic simulations are probability maps for different percentiles, e.g. P10, P50 and P90 maps for trapped column heights and volumes. Different types of of risk maps can easily be created. Two examples of such risk maps are Flowrisk, which shows the chance of not having charge and Phaserisk, which shows the risk of not having liquid phase charge. Migri also provides functionality for detailed analysis of Monte-Carlo simulations, showing detailed information about the calibration results and input parameter space for the best simulation runs. Flowrisk – chance [%] of not having charge (migration or trap) in a carrier. The input data and time available does not always allow for performing detailed 3D hydrocarbon migration studies. Migri therefore contains functionality for conducting quicklook migration analysis in a few minutes. Simply drag a depth map into an empty model, adjust the most important parameters (source rocks, temperature) and run the simulation. Use the drainage area picker to map out and export drainage areas and identify spill fairways. Statistics of expelled volumes and maturities within each fetch area are easily available. For users who only require the quick-look modelling functionality, we also offer the low-cost and lightweight MigriX tool. MigriX is built on the same model and process descriptions as Migri, but offers a smaller set of features. For more in-depth studies using Migri, sensitivity analysis can be be performed to test alternative geological models and to assess the effects of uncertainties in the rock properties on the modelling results. Migri offers various fault seal models, which allows for detailed analysis of the sealing behaviour and its effect on the hydrocarbon column distributions. For more in-depth studies, sensitivity analysis can be be performed to test alternative geological models and to assess the effects of uncertainties in the rock properties on the modelling results. Migri offers various fault seal models, which allows for detailed analysis of the sealing behaviour and its effect on the hydrocarbon column distributions. The evolution of the hydrocarbon traps through time can be easily be tracked in the Migri TrapViewer. This allows for reporting the volumes entering and leaving the trap, as well as phase properties such as GOR, GCR, densities and composition of oil and gas. Different purchase and licensing options are available for Migri. Please contact us if you would like more information, or if you would like to try out Migri for yourself.